Each purchaser of a Magic Pendulum is in for a special treat: an eBook written by Pablo Amira. We were delighted when this legend of mentalism agreed to lend his expertise to new and seasoned pendulum users alike. We are also thrilled to offer here, Pablo's outstanding work and thinking on pendulums. Do you want to know more about this wonderful tool?Do you want to learn how to enhance your repertoire and performances? In this document I share ideas,premises,concepts and effects that comes from years of trial and error and experience with pendulums. You will not only received an eBook with your purchase, but also a companion video with performances and in depth explanations about one new concept about pendulums that you will really enjoy. With contributions from Rich Hennessey and Mauricio Jaramillo. Ideas for beginners in pendulums,reframing effects in your favour, how to deal with resistance, performance theories, a new Russian roulette type of effect, a off-beat serial number divination an a lot more in Ideas Vol. 1 : Pendulums. I love pendulum work, being that I use much of it. Pablo's pendulum book is the most updated book I have ever seen. I have never seen a book dedicated to so much excellent pendulum work; it’s full of brilliant ideas. I love this book so much and recommend it; if you want to do pendulum work, this is the book. For those of you that have not used pendulums before, it will take you through a journey and open doors that you never imagined since the pendulum is the strongest tool you can ever use. Pablo’s book does all this and more, you will never need anything else. Great job Pablo, I am in love with this book. Pablo this work is fantastic. is but they eluded me. Your modification on the haunted key takes that idea to a whole new level. Pablo, I may be a tad biased towards pendulums , but without a doubt you have put together an incredible book devoted to this underutilized tool for mentalists. The variety of effects is off the chart and the quality of the work the same. In addition, the tips and touches contributed throughout the book are of great value. I hope people are paying a lot of attention to these fine points. I constantly found myself inspired to create new effects and variations of those included. To me this is a sign of exceptional work. 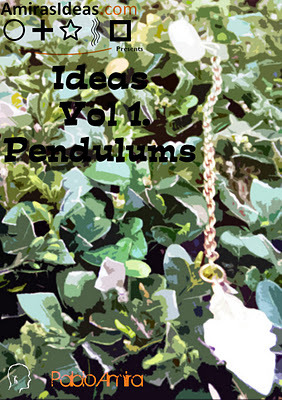 Ideas Vol I: Pendulums is guaranteed classic status. Whether you are new to pendulum work...or an old hand at dowsing...this book has something for all. There are very well thought out ideas and presentations....many of which...will inspire inventive performers to create their own unique routines. This is a lot of material, I wonder how long took it for Pablo to put it all together! If you like using pendulums for some effects, now you are going to love it even more. Pablo goes from the very basics of the workings with pendulums, to the real work of routines, effects and interesting ideas. I proofread this E-book and really enjoyed it. As usual, Pablo's work is excellent and very detailed. I work with pendulums every single day, they really are the most under-utilized tool in Mentalism. Pablo not only offers a ton of real world tested routines but he also includes a video which really makes things clear, specially his suggestion force. Much success with this book Pablo, I highly recommend it. Pablo's thoughts are to have fun and get sitters excited about the Pendulum and it's job... Which way it will move in their hands. They can do it because they have a great imagination! Pablo's thoughts are inspiring and I'd put money this work become the treatise on pendulums. Similar to EB's switchcraf, I can see this work ever evolving and growing and I'm excited to see where Pablo allows it to go! The only reason a lot of us don't use pendulums now, is inhabition. A little bit of Fear... This book can better guide in addressing and overcoming any fears we may have (or think we have) towards pendulums. And I'll put money that if you have fun with pendulums and take them seriously, you will surprise yourself. Thanks for this work on pendulums Pablo... The community will benefit from it. There's a lot of talk by performers and would-be performers about how they value propless mentalism and mind-reading. 90% of it is pure laziness: it's tough to perfect sleights, it's a pain to create gimmicks, and it's hard work to reset stuff. Many of you will be tempted by the apparent ease of Pendulum work and the claims of Real Magick. To say that the Pendulum is hard wouldn't be fair, but I think many people will underestimate the work that Pablo has put in on this invaluable tool. And if you want the results that those who love and use the pendulum get, it will require some commitment on your part. Nothing onerous... but like all great mentalism it requires an audience and performance... but unlike most mentalism, you will also be able to use it as a tool to get inside your own mind and productively tinker. If you're familiar with George Anderson's, Jerome Finley's, Richard Webster's or Bill Cushman's work on the Pendulum, I promise that you will find inspiration here that will make it worth the investment of your time and money. A fresh and eye opening look at the pendulum, resonant effects with powerful symbolism. What always has excited me about pendulums is you can give people empowering knowledge to take away with them, namely how to investigate the unconscious via ideomotor response... & in the process of doing so sell yourself as a performer in the strongest way possible with these innovative applications. It is gaff-free powerful mentalism that happens in their hands... what more could you want? This material is a real treat for pendulum enthusiasts. There are numerous routines and ideas and the included video makes everything crystal clear. I love the haunted key routine. The addition of the pendulum with the key adds many more layers of mystery. Pablo cares about his work and this comes across in the video supplement. Thanks for releasing this material. I look forward to adding some of these new pieces to my professional act.